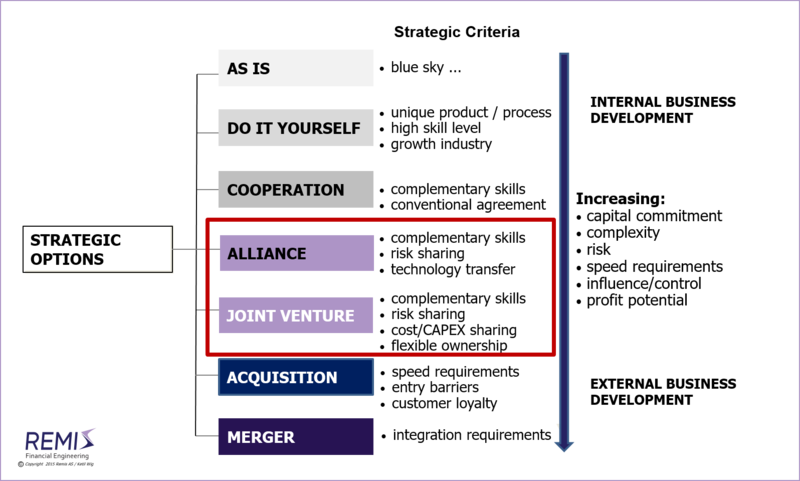 Strategic alliances and joint ventures are part of the tool set within the scope of M&A strategy, but many do not associate business development alternatives without ownership participation (e.g. a strategic alliance) as an M&A option. Strategic alliances have the key benefit of low capital commitment and significantly reduced risk vs. an acquisition or a merger. The primary disadvantage is a lower degree of management influence and operational control. A strategic alliance may be defined as a multi-functional agreement with mutual two-way interdependence. The exchange of benefits vs. dependence is common practice in a number of areas without it being interpreted as an alliance. An example is in modern purchasing, where a reduction in the number of suppliers is exchanged for in-depth partnering with a selected few. The reciprocity (for increased volume as a preferred supplier) may, e.g., be within integrated product development/innovation management, IT systems integration or new administrative routines (e.g., transparent pricing). Strategic alliances may therefore be viewed as expanded customer-supplier relationships with the strategic basis being the complementary skills, mutual specialization, risk sharing and technological exchange between the two parties. An agreement-based strategic alliance may be expanded with joint ownership, or be based on a jointly-owned, new corporate structure. A joint venture is, by its very nature, an expanded strategic alliance based on risk sharing, mutual financing and flexible ownership structured to fit the situation and the preferences of the complementing partners. Many overseas market entry initiatives apply this method. In principle, you exchange distribution channels and market access for access to products and technology. In sectors with high entry barriers and a need for “assisted market entry,” this method is particularly suited; e.g., within the international telecommunications industry. Many developing nations (e.g., India, Malaysia, China, etc.) insist on using this approach for foreign investments in important national industries. In other countries (e.g., Brazil), requirements for “domestic content” are driving the same joint venture structures. Acquisitions represent higher capital commitments and risk than do strategic alliances; key preconditions should be related to speed requirements or entry barriers. If these characteristics are absent, a strategic alliance may be a preferable alternative – one requiring significantly less capital and lower risk. An under-rated factor is that a necessary prerequisite for a successful acquisition is high customer loyalty to the acquired entity. There are a number of additional pitfalls associated with acquisitions; of primary importance is sufficient emphasis on post-merger integration management. A strategic alliance may compensate for these weaknesses through the customer loyalty of the local partner, and the fact that the need for a post-merger integration has been eliminated. On the other side are requirements for tight controls and implementation which favor an acquisition over a strategic alliance. Therefore, a critical issue is if influence should be handled through control mechanisms built into the joint structure – or alternatively be executed directly through the business partner of the strategic alliance or joint venture. Low capital requirements, lower complexity and reduced risk are the core arguments for considering a strategic alliance or a joint venture over an acquisition. In far-away markets which require in-depth local knowledge these tools are particularly well suited. Organic expansion through subsidiaries or acquisitions may be preferred closer to the corporate HQ where controlling risk is easier. Also read the separate article on The Fundamentals of M&A Strategy, on Buy-Side M&A, on Sell-Side M&A, on Equity Based Financing of Start-ups, on Financial vs. Industrial Ownership, on Synergies and Poor Judgment, on Developing High Quality Business Models; on M&A Process Management and about Post-Merger Integrations. See Download Center: White Paper #2: Strategy - and the Proper Use of M&A Tools; White Paper #5: Buy-Side M&A (mergers and acquisitions); White Paper #6: Sell-Side M&A (divestitures, trade-sales and mergers); or White Paper #7: Should You Choose Financial or Industrial Investors/Owners? ; or White Paper #8: Equity Based Financing of Start-ups and High Growth Situations.